Don't use a full stand to mount your drums and percussion when the Meinl HMC-1 would do. This steel clamp features a modern black powder-coated finish. It secures to a hi-hat stand or cymbal stand to mount cowbells, tambourines, and even small snare drums neatly - no wasted space. 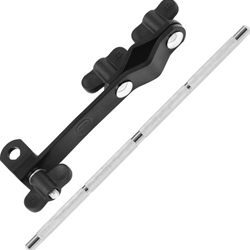 A feature Remix drummers found useful was the adjustable 3/8" mounting rod (included). Not only does the Meinl HMC-1 clamp adjust for optimal positioning on a stand, but the rod features knurled sections and a separate thumbscrew for raising and lowering. This helps get your percussion instruments right where you need them. Create a cleaner stage and practice space with the Meinl Percussion HMC-1 multi-clamp!